The guitar neck fingerboard radius, or neck radius as it's sometimes wrongly called, describes the height of the arc of a guitar fretboard. To understand the term, look at the picture on the left. You'll see that, contrary to what you might have thought, the fingerboard isn't flat. It's curved. Why? To make it easier to fret chords, particularly barre chords; our fingers aren't flat, so having a curve, or arc, on the fretboard allows us to press more easily on it. Not all arcs are equal however, some are flatter, and others steeper. So the neck fingerboard radius is a measurement of the degree to which the fingerboard is curved. The figure itself is the radius of the circle that would be formed if you followed the curve of the arc around for a full 360 degrees. The easiest way to picture it is to imagine a circle, say with a radius of 10cm (4in). Cut an arc, with a base of 2cm from anywhere on the circle. That arc is the fingerboard and the radius is 10cm. 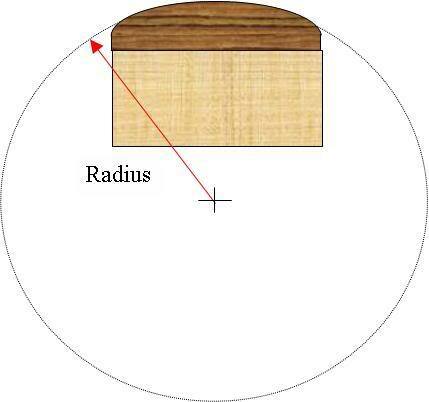 The radius is usually expressed in inches. Fender commonly uses a radius of 9.5in for its Strats and Telecasters, while Gibson Les Pauls have a fretboard radius of 12in. Why the difference? Because it affects playability. 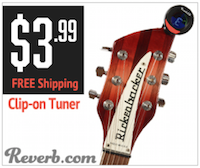 A shorter, steeper radius is great for rhythm playing, because it makes fretting chords easier. But it's not great for playing lead, unless you push up the action on the strings to stop them 'fretting out' when you bend them. A flatter, longer radius is better for lead playing because it allows you to move your fingers more quickly over the fretboard (flatter=faster) and there's much less chance of fretting out when you bend strings. Guitars built for shredding, from the likes of ESP, Dean, and Jackson, have an even longer radius, up to 16in, to allow for lightning fast finger movement over the strings. Simple, huh? Except we're not quite there yet, there's one more thing. Warmoth devised a fingerboard profile that it believes offers the best of both worlds, a compound radius, or conical fingerboard. The compound radius fingerboard is rounder at the nut end than it is at the heel. So you get the benefit of a short radius at the point on the fretboard where you usually play chords, and the benefit of a flatter radius higher up where much shredding is done.